In the present time of cut throat competition, users are under great pressure to reduce the cost of production. To achieve this objective, many times vacuum oils are not changed at specified intervals to get more “life” from them. Oils degenerate on account of oil oxidation. In Oxidation, oxygen reacts with the oil to form Hydro-peroxides. Hydro-peroxides are unstable and break down into Ketones. Ketones further oxidize to form Aldehydes and Carboxylic acid. Now Carboxylic acid attacks the pump metal parts as well as O rings, Oil seals etc. causing acid corrosion. That is not all. By products of oil oxidation in the presence of acid further react and combine to form larger molecular species which polymerize to form sludge. Flow chart no. 1 – Degeneration of oil. · Jamming and breakage of vanes in the Rotary Vacuum Pump. · Overheating and damage to the pump interiors in the Diffusion Pump. What is even more damaging is that this process is like a nuclear chain reaction that keeps speeding up with time. With oxidation, oil thickens and this reduces lubrication, which in turn results in a higher temperature. At increased temperature the rate of oxidation further increases (Rate of oxidation doubles with every 100C rise of temperature as per Arrhenius rate rule). This damages costly vacuum pumps in a short time. Flow chart no. 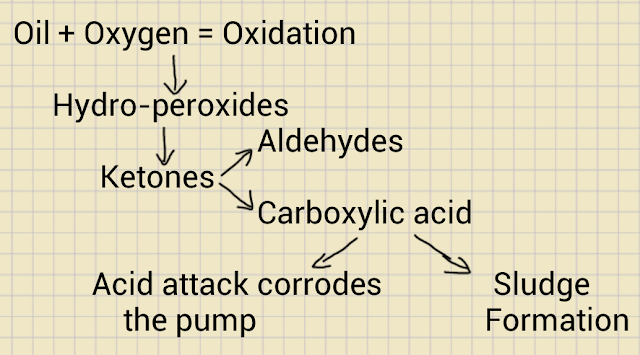 2 – Oil oxidation: chain cycle. Oils therefore must be changed as per specified schedule. 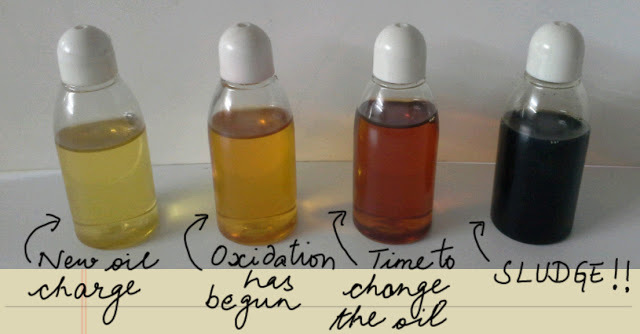 Note: In this blog post I have explained the oxidation process of hydrocarbon/ mineral oils. In a different post, I shall explain how silicone oil degenerates.